Example image above shows what can be custom made for you and is an example only. 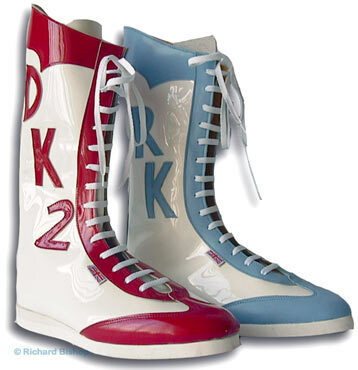 Wrestling Boots custom made to your requirements from as little as £170 email me quote Named White Patent leather wrestler and ask for more information and detail clearly what your wishes in design are. Basic cost is £170 then each additional letter/star or design work doubling up on each boot is a further £10. You can have any colour combination you wish which again is another £10 on top of the classic price. For additional work email before buying .